After spending the first eighteen years of her life growing up on the edge of nowhere in Minnesota, Stacey (née Kigner) packed her bags and headed east to attend Vassar College, where she majored in English and spent four years in the school’s recreational circus group, the Barefoot Monkeys. She has performed up and down the east coast in performances ranging from street fairs to music videos. She specializes in aerial silks, solo and duo lyra and Spanish web. 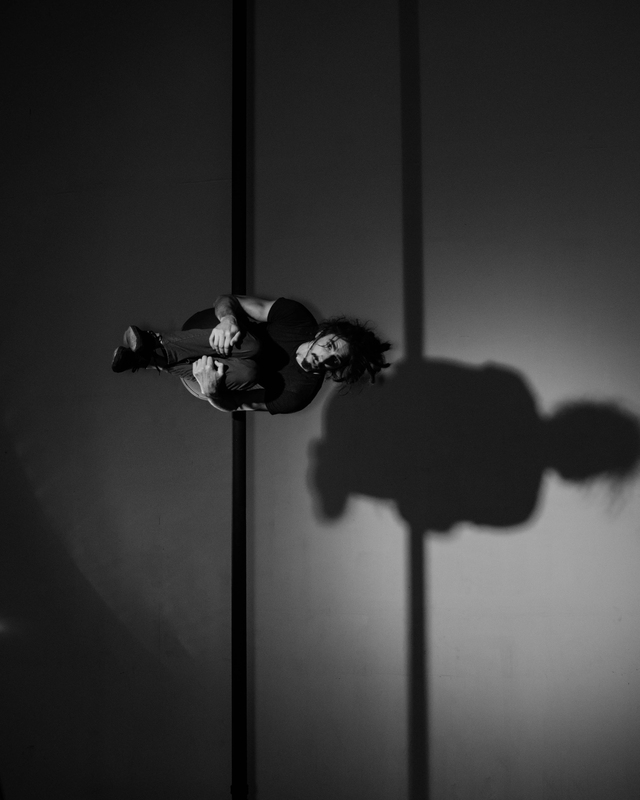 In addition to performing and teaching, she has produced and directed a number of professional shows including Missed Connections, SPECIAL RELATIVITY: Circus Through Space and Time, and How the Light Gets In. Her show, Sherlock Holmes and the Sapphire Night completed a New England tour in 2017. She completed her Fabric Teacher Training in 2011 at NECCA. She opened Air Temple Arts in 2013. As a teacher her aim is to build a sturdy foundation on great technique, with an understanding of aerial theory so that her students can unlock their ability to innovate authentically, safely and creatively. In 2015 she was acknowledged as one of New Haven’s ‘Rising Stars’ by Business New Haven, and featured on the national PBS program START-UP. She published her first book, The Sum of All Paths in 2015. She is a New York Times published photographer, and works under the banner Seriffim Photography. Nick has been involved in circus arts of one kind or another for over a decade. He started riding unicycles as a way to cross train for freestyle skiing in high school, but was soon addicted to riding on one wheel just for the fun of it. Since then he has taken up juggling (and other object manipulation), partner acrobatics, and Chinese pole as major areas of interest. In addition to those traditional circus arts, Nick is an accomplished fire and sideshow performer with a wide variety of skills. From 2009 – 2013 he was the head of Safety for Wildfire, a fire arts retreat. He studies Chinese Pole with Sandra Feusi at the New England Center for Circus Arts. His past performance highlights include juggling alongside Emperor Norton’s Stationary Marching Band, repeating (on location) a suspended straight jacket escape first performed by Harry Houdini, entertaining audiences between sets at the World/Inferno Friendship Society’s annual Halloween shows, performing as one half of the circus duo Soviet Bloc Party and performing in the full length shows “Missed Connections” and “Special Relativity.” In 2017 he went on tour with Cirqularity’s production Sherlock Holmes and the Sapphire Night as one of the lead roles and performed a solo on Chinese Pole, a partner acrobatics duet, hoop diving, and group acrobatics. When not teaching or performing, Nick is putting his Mechanical Engineering degree to good use as Air Temple Arts’ resident rigging expert. He has been responsible for designing, building, and maintaining all of the points at both air temple’s old and new locations. In addition to in studio work, Nick also heads up rigging at all Air Temple performances. Since two-years old Elaine has been trying to find out exactly how far she could push her body. The first outlet she found for all of her energy was a gymnastics gym. As a high schooler she began teaching “Mommy and Me” and Tots gymnastics and continued to coach lessons and pre-team through college. Once she had exhausted the gymnastics outlets available to her, she dabbled in pole dance, swing dancing, and Brazilian jiu-jitsu, but nothing really stuck until she got a fateful phone call from a friend. The phone call began with her friend stating very matter-of-factly, “I know you secretly have always wanted to be in the circus.” Together they went to a flying trapeze class, as she took off the platform for the first time and felt that first rush of adrenaline, she knew she had found what her body was meant to do. That was almost six years ago, and flying trapeze was her gateway into various other aerial arts, including mostly aerial silks with some static trapeze, lyra, straps, and trampoline. 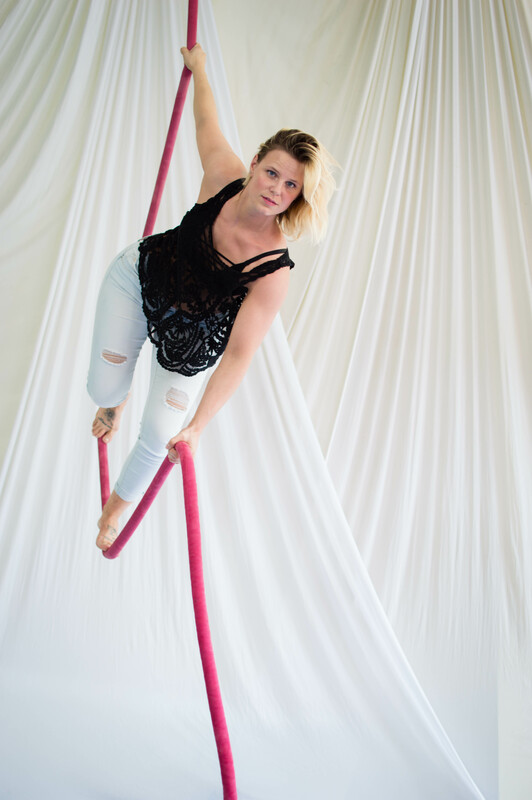 Coaching at Air Temple Arts has offered her the opportunity to combine her education degree and her passion for aerials while giving back to a community that is immensely important to her. Liz prides herself on keeping her persona as much of a mystery as possible. However in her life she has studied Opera and Vibrato Techniques at Alfred University, performed as a professional fire eater, and currently attends Post University where she is pursuing a dual Bachelor’s Degree in Human Services and Criminal Justice. 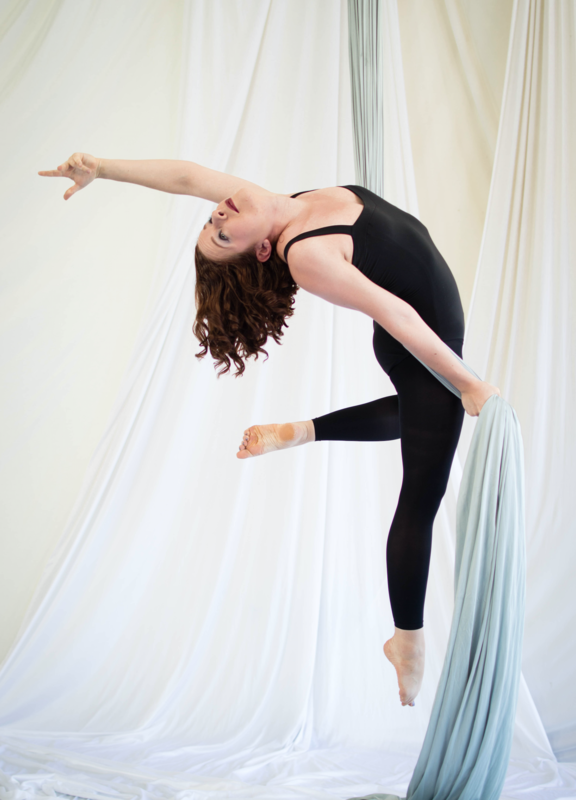 As far as circus is concerned, she began silks classes recreationally in 2013 and currently teaches Corde Lisse and Static Trapeze at Air temple Arts. She performed Corde Lisse for Cirqularity’s Reverie in Black and White, and group acrobatics in their touring show Sherlock Holmes and the Sapphire Night. She has taken several Corde Lisse Intensives at NECCA and studies rope there with Molly Graves. Casey grew up pursuing a variety of athletic pursuits, first as a cheerleader, then track, cross country, and weight lifting throughout high school. She started circus during a rough patch in January 2016, looking for something to help her build confidence and self esteem. 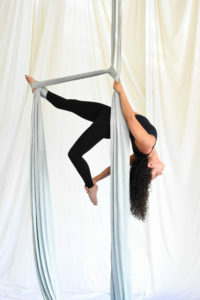 She began taking silks and later expanding to Lyra and Chinese pole. Her favorite part of teaching is being able to share the passion and encouragement that got her to where she is today. Her favorite quote related to aerials is ‘it’s not I can’t, it’s I haven’t yet’ which helps her through any tough training sessions. 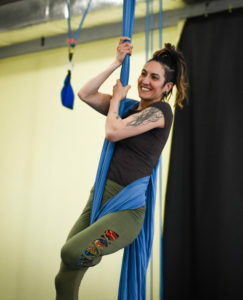 She completed Air Temple’s Aerial Teacher Training in 2018. Dani has been training for the circus since a very early age but didn’t recognize it until this past decade. As a child, she and her sisters would play various kinds of physical activities in the backyard; from tree climbing to rigging their own slack line with a rope between two trees, and even taking daring feats of sledding down grassy hills in the middle of summer. The three of them were always looking for the next exciting physical activity that they could create and play together. They started taking tap dance lessons together and would put on shows for anyone who was willing to watch. Dani partook in numerous plays and musicals starting at age 6. She was a cheerleader in high school and for a few years at college, always excited about the stunting and dancing aspects. In 2009, she was introduced to the hula-hoop as more than just a circle that goes around and around your waist. Since her first trick on the hoop, she became obsessed. She began making her own hoops and teaching hoop dance classes to all ages across CT. She dove deep into the circus world exposing herself to other circus arts like juggling, poi, diabolo, partner acrobatics and then finally, aerials. She was hooked on aerials since her first knee hang on a trapeze in 2014 (pun intended). She started teaching at a children’s circus camp and knew she had found her calling. In 2010, she graduated from the Connecticut Center for Massage Therapy and applies her knowledge of anatomy and kinesiology to her teachings. She has attended two aerial teacher trainings (Paper Doll Militia/Born to Fly and Air Temple) and continues to further her education by being enrolled in Born to Fly’s aerial teacher certificate. Dani believes that movement is a holistic approach to freedom. She advocates that circus is a meditation and can bring boundless options to our lives. In her experience, the art of play and circus has helped her find community and love for herself and others. Since then, Kate has been training in silks, lyra, sling, Chinese pole, aerial partnering, and partner acrobatics. She can be seen performing in circus shows as a sad clown, an evil minion, a sky witch, or even Prince. She also stage-managed the touring production of “Sherlock Holmes and the Sapphire Night.” She began teaching aerials in 2016. She loves trying new apparatuses and new tricks, and especially loves helping guide other people into the aerial world. 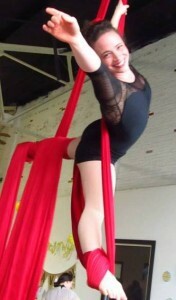 She completed Air Temple’s Aerial Teacher Training in 2018. Jillian grew up dancing since the age of three. For the majority of the next two decades, she did everything from classical ballet to tap, jazz, and modern dance. She received professional training at the School of Performing Arts, now known as FineLine Theater Arts, in New Milford, Connecticut until 2007. She continued dancing through college, majoring in modern dance, and graduating in 2011 with a BFA in dance Performance from the University of the Arts in Philadelphia, PA.
All the while, Jillian has always had a love for being upside down and climbing anything she came across. 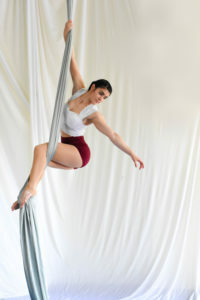 In 2014, she came across Air Temple Arts in New Haven, Connecticut and received the training she needed to progress to a performance level. A year and a half later, she began performing with Air Temple, and has been doing so ever since. During her time at UArts, she also discovered her passion for teaching. She was an English tutor during her time there, and now, as a full time licensed Massage Therapist, has been teaching massage therapy for the last 6 years. Nothing compares, however, to the ability to share her passion for aerial arts, and she is excited to be a part of the Air Temple staff, and began teaching silks earlier in 2018 after completing Air Temple’s Aerial Teacher Training in 2018. Before Lauren started walking she was dancing. Her mother put her in dance classes when she was just a year old, and hasn’t stopped since. Faithful to dance, once she graduated from her studio she returned as a teacher. Lauren grew up training in any and every style of dance and passed on her love for those styles and performances to her students. Thinking that dance was the only true love she had in life, she came across Air Temple Arts in March of 2016 and decided to take an aerial silk class because, “Why not?” Signing up session after session Lauren found to love the challenge, strength, and beauty of dancing on the silks. One year later she choreographed her first silk act and performed in Air Temple’s Spring 2017 Open Stage and then later that year choreographed and performed another silk act in Reverie Spirit and Shadow. Since then she has gone on to teach silk classes at Air Temple as well as flexibility. In Lauren’s eyes the best part of teaching is watching her student’s grow week after week and unfold a new kind of confidence in themselves they didn’t realize they had. Lauren has faithfully trained silks since she started at Air Temple but has dabbled into other apparatuses such as Chinese Pole and Lyra. Even though her first aerial love is silk she has also gained a strong passion for Corde Lisse and hand balancing. In 2018 she started training hand balancing at NECCA with Chris Gatti. Lauren has loved being in the air or upside down since her very first aerial class. She loves creating and playing with acts ideas, helping others find fun sequences and thinking up crazy and strength-y sequences and putting them into place in the air.